TABLE SPONSOR: $600 – includes 4 dinner tickets, 4 VIP Reception tickets, and one ticket to the private roundtable discussion with Governor Ehrlich. VIP SPONSOR: $300 – includes 2 dinner tickets, 2 VIP Reception tickets. HOST: $150 – includes 1 dinner ticket and 1 VIP Reception ticket. 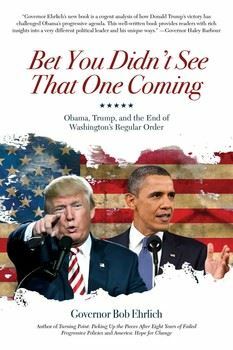 Tickets include seated dinner and a copy of Governor Ehrlich’s newest book, Bet You Didn’t See That One Coming: Obama, Trump, and the End of Washington’s Regular Order. The VIP Reception will include complimentary drinks and a cash bar will be available for dinner. Additional books will be available for sale and signing for $20 each (as supplies last). ABOUT GOVERNOR ROBERT EHRLICH: Robert Ehrlich was the 60th Governor of Maryland from 2003-2007. Along with his running mate, Michael Steele, Ehrlich beat Maryland Lt. Governor Kathleen Kennedy Townsend, daughter of the late Robert Kennedy, in a hard fought campaign. Prior to serving as Governor, Ehrlich represented Maryland’s 2nd Congressional District from 1995-2003. Ehrlich served as the Maryland Chair for Mitt Romney’s 2012 Presidential campaign and was a surrogate for Donald Trump’s campaign, endorsing Trump in May 2016. Ehrlich campaigned in mostly blue leaning swing-states like Pennsylvania, where he worked to appeal to blue-collar, Reagan Democrats. 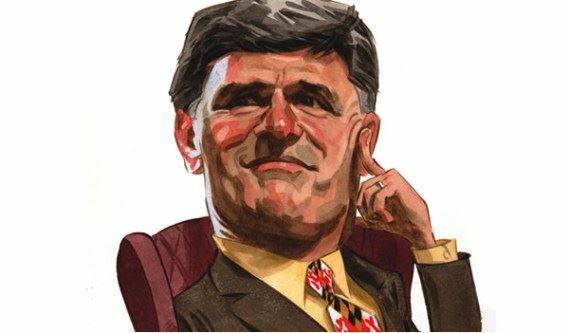 In addition to his appearances on cable news shows, Ehrlich is a columnist for National Review andThe Baltimore Sun. ABOUT GOVERNOR ROBERT EHRLICH: Robert Ehrlich was the 60th Governor of Maryland from 2003-2007. Along with his running mate, Michael Steele, Ehrlich beat Maryland Lt. Governor Kathleen Kennedy Townsend, daughter of the late Robert Kennedy, in a hard fought campaign. Prior to serving as Governor, Ehrlich represented Maryland’s 2nd Congressional District from 1995-2003. Ehrlich served as the Maryland Chair for Mitt Romney’s 2012 Presidential campaign and was a surrogate for Donald Trump’s campaign, endorsing Trump in May 2016. Ehrlich campaigned in mostly blue leaning swing-states like Pennsylvania, where he worked to appeal to blue-collar, Reagan Democrats. In addition to his appearances on cable news shows, Ehrlich is a columnist for National Review and The Baltimore Sun. He is also the author of Turning Point: Picking Up the Pieces After Eight Years of Failed Progressive Policies.